We had already discussed the construction and theory of a two-input AND gate using mechanical switches. Since mechanical switches are clumsy and very slow, we replace them with electronic switches. During the initial periods of evolution of digital technology, mechanical switches were replaced with vacuum and later with semiconductor diodes. In this section, we describe the principles of operation of the diode-logic (DL) AND gate, which have become thoroughly obsolete. However, industry-standard TTL NAND gates have been developed from DL gates. The DL AND gate is discussed here just to illustrate how TTL NAND gate is developed from it. 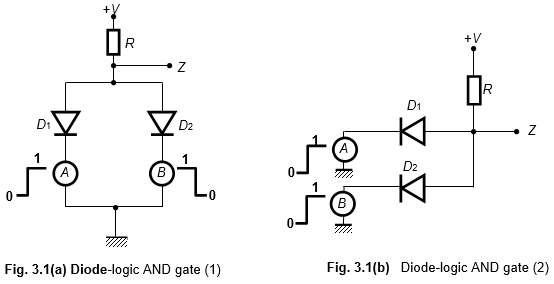 Figures 3.1(a) and (b) show two different forms of the same diode-logic AND-gate structure. As shown in Fig. 3.1(a) and/or (b), when inputs A and B are at 0 level (i.e., input pulses from the pulse generators at 0-volt level), the input terminals get shorted to ground, and current flows from +V through resistor R and diodes D1 and D2 to ground. In this condition, we find that the diodes are acting as dead short across the output terminals making it to be at 0-volt level. This means that when A = 0 = B, Z = 0. The same situation occurs even when A (or B) alone is conducting and B (or A) is OFF. That is, when A = 0 and B = 1, or when A = 1 and B = 0, we find Z = 0. Now, if the input pulse is raised to +V volts (= 1) across both the diodes, they become reverse biased and stop conducting. There will be no current through R and hence Z = +V volts. This means that, when A = 1 and B = 1, Z = 1. These operations thus describes an AND function.